The Loudoun Soil and Water Conservation District (LSWCD) is seeking a part-time Education Specialist to work 18 hours each week. The District office is located in Leesburg, VA. The successful candidate will assist in carrying out the Education objectives of the District. This includes educational outreach for K-12, focusing on environmental and conservation education. Minimum education and experience requirements include: any combination of education and experience equivalent to graduation from high school supplemented by college level courses in education or an environmental field. Completion of Project WILD, WET, and LEARNING TREE is a plus, as is marketing experience. Requires the ability to work a flexible schedule that may include days, evening, or weekends. Requires a valid driver’s license. Background check required. Starting salary: $15-$18/hr. depending on education and experience. No benefits are offered with this position. For a complete job description, contact Suzanne Brown, District Operations Manager, at suzie.brown@lswcd.org. Candidates must submit an application packet that includes: 1) completed state application; 2) one page narrative summarizing their experience and 3) cover letter. Resumes will not be accepted in lieu of a completed State application. Applications that say “see resume” and incomplete applications will not be considered. State application and narrative form is available at: lswcd.org and must be mailed to: Loudoun SWCD, Attention: Suzanne Brown, District Operations Manager, 30 Catoctin Circle, SE, Suite 218; Leesburg, VA 20175. Application packets must be postmarked by April 17, 2019. The Loudoun Soil and Water Conservation District is an equal opportunity employer. Project Funding Now Available to Homeowners! Through the statewide Virginia Conservation Assistance Program, the Loudoun Soil and Water Conservation District provides financial incentives to Loudoun County homeowners and business owners to create more watershed-friendly landscapes. Eligible practices include: conservation landscaping, rain gardens, impervious surface removal, porous pavement/pavers, cisterns, dry well, vegetated swales, bioretention, and infiltration trenches. For more details about the program, visit the VASWCD website. The newest edition of the Conservation Education Newsletter is now available. This edition includes information about worms, Dominion Envirothon, and Soil and Water Stewardship Week. For more information, please contact Charlotte DeMolay, Education Specialist with the District at charlotte.demolay@lswcd.org or by phone at 571-918-4530, ext. 109. 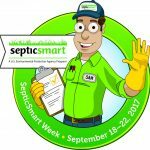 Governor McAuliffe has proclaimed September 18-22 to be SepticSmart Week throughout Virginia. https://governor.virginia.gov/newsroom/proclamations/proclamation/2017-septicsmart-week/. Proper septic system use and routine care are vital to protecting public health, preserving our groundwater, lakes, streams and waterways, and avoiding costly repairs that can result from neglect. The Loudoun Soil and Water Conservation District thought this would be an appropriate time to announce our pilot “Septic Tank Pump-Out Rebate Program”. The program will provide a $50 rebate to Loudoun landowners towards the pump-out of their septic system. A limited number of rebates are available. The landowner must have an approved application form from the District, and the pump-out must be reported to Loudoun County Health Department by an approved hauler, before the rebate can be issued. Septic pump-outs prior to September 21, 2017 are not eligible. The funds used to start this pilot project come from the Virginia Conservation Assistance Program, or “VCAP”. VCAP is a program of the Virginia Association of Soil and Water Conservation Districts which allows non-agricultural landowners the chance to receive cost share funds to install conservation practices. For decades, Loudoun farmers have been able to take advantage of the Virginia Agricultural Best Management Practices Cost Share Program to help protect soil and water resources, and now with VCAP, suburban, urban, and other residential and business property owners are able to install practices such as rainwater harvesting, conservation landscaping, and a host of other initiatives. Through fiscal year 2017, ten VCAP practices have been signed up which have included meadow plantings, tree plantings, rainwater harvesting systems, and a vegetated stormwater swale. The project sites have included homeowners’ lawns, as well as HOA open space parcels, and a school property. Districts that participate in VCAP, earn $500 in technical assistance money per VCAP practice completed. The funds can be used at the District’s discretion. The Loudoun SWCD Board felt strongly about using these funds to put more money for conservation into the community. At a recent District Board meeting, the Board voted to use these funds to assist in the launch of a local septic tank pump-out project. Loudoun SWCD is appreciative of being able to make those VCAP dollars go even further for conservation on the ground in Loudoun County. If you are looking to build a barn, enter into open space or agricultural land use taxation, or just want to get some ideas managing your farm, LSWCD has a new revised Conservation Farm Plan which is now more tailored to specific different types of farming operations in Loudoun. Farm plans are required by Loudoun County for the building of barns, entering the Land-Use Tax Program, as well as for grazing livestock on parcels under five acres. Small acreage grazing plans are developed by the District and Loudoun Cooperative Extension to help landowners manage livestock on small properties. Contact LSWCD at (571) 918-4530 to schedule an appointment to create a farm plan for your operation.